Finally have enough spare time to hit the gym! Did the office gym right before lunch. Decided to celebrate my freedom with a “fun” workout. notes: I wondered if my chest would be burning, but NOPE! My rear delts were so pumped and on fire!!! I was in pain between sets. 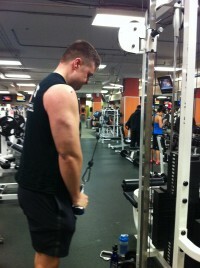 The pump hurt so bad, I needed to stretch out my rear delts between sets. 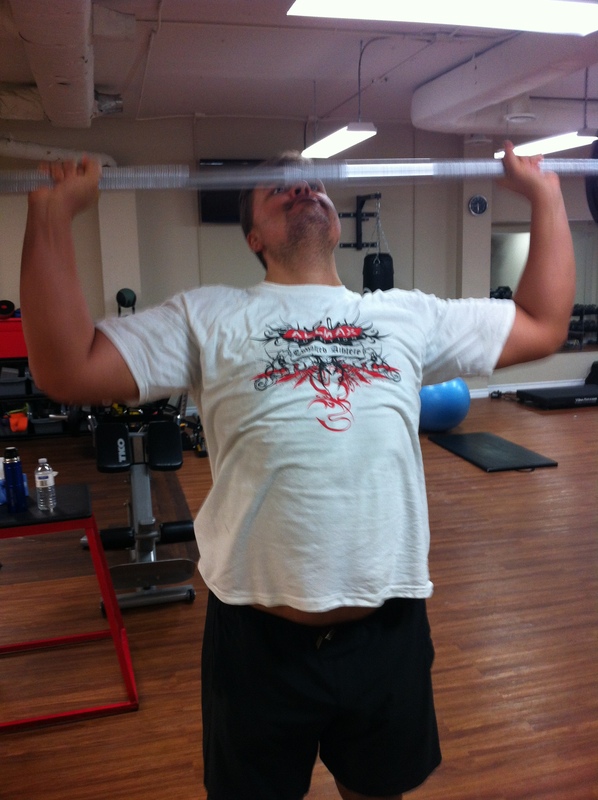 If I just sat there normally, my rear delts burned… I had to extend my arms forward and stretch them out to feel better. notes: I went for a third set… but my shoulders just rebelled, I couldn’t even pick up the 10 lb DBs any more LOL. By this point, the rear delts burned so bad that the only time they STOPPED burning was when I was doing the 6 way raise… but the over and backs burned like hell. notes: this was a random mix just to speed things up, I supersetted arm work with abs. 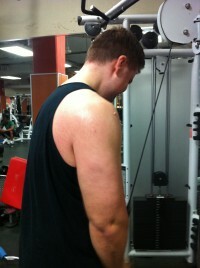 I went light on triceps and just pumped out the reps until my arms wanted to pop. Noontime office workout. Small miracle that my upper body is being cooperative these days, lol. so I put it to work. warmup: nada. 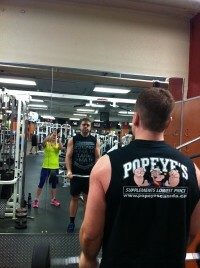 I was guiding another dude through his workout simultaneously, so that chewed up extra time. notes: no sleeves or wraps. felt pretty easy, so I focused on my cues. Buddy did bench press, I did OHP, same style sets though, light weight short rests. notes: slow, controlled front raises. I still needed cardio, so after work, I went out and walked in the sunshine downtown for a while. Bought some protein. Decided to approach my training in a different way. I wont be hitting the gym to feel competitive for a while. I will just go now to feel better, build some muscle, improve my conditioning. 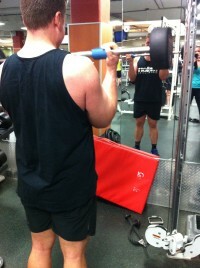 Still weights, still heavy weights, still strongman… I just don’t have goals beyond “go heavier”. At least until my personal life calms down a bit. Early morning office workout. Short rests, light weights, break a sweat. After work, I went for another massage. Hit my hips, glutes, low back, then upper back, traps, neck, shoulders. Deep tissue, hurt like hell. Actually I hate deep tissue on my neck, it makes me paranoid like I wanna fight someone… its threatening somehow. But I dealt with it and got through it. Feelin good right now. Thursday was an off-night, I just wanted to get a pump and be a bit active. notes: pump now fully in effect. I love a chest pump and the DOMS the next day. notes: 2nd crappy week in a row on the clean and strict press. I just couldn’t get it going. And only 2 weeks ago 135 for 3 reps was no big deal. I need to sit down with my coach (she is travelling right now) and get some help, because I think my form must be breaking down and its costing me my performance. I could clean it, but I couldn’t strict press any more. So I ended up just doing push presses. Very disappointed. notes: This still is feeling good. Upped the weight a bit and was still hitting the sweet spot. notes: This was a big improvement from last week. My hips felt tight last week so I sat on a rolled up light yoga mat, and the warmup sets felt so good that I knew I had a good shot. My eventual goal is to sit flat on the ground, but this was a good few sets. notes: Decided to take a break from the 6-Way complex, as I know it hurts a bit on the shoulder (it hurts in a kinda good way, but it is still stressful). I kept the front raise weight the same so I wouldn’t have to keep chasing down dumbbells and just changed the pins on the machines. I have learned a few tips to keep my shoulders feeling good, for the front raises I bring the DBs down with a neutral grip (hammer grip), and then pronate my palms on the way up; and for the reverse pec deck, I hold the handles with my thumbs facing down so as to hit my rhomboids more. Sets felt good so I kept upping the weight until I found the sweet spot. Arm fluff time! Something more traditional than Cannonball Sets this week. notes: high rep plumpness! Arms were tired but nice and full! They didn’t have that amazing tight feeling, but they did have visible size on them. It wasn’t my best pump ever, but it was still fun. notes: Upped the weight this week! Got real tough on the curls! notes: Upped the weight on these as well. Felt great! notes: And I dropped the weight on these. And went back to the bar for skullcrushers. Preachers still tough! post-workout: 60 min Spin class! Great cardio blast to top things off. ok, so this is out of order, I did this before Legs. sue me! been a while! back at it! We have a special guest – my friend Katie came to work out with me! Yay! Having company at the right time can push you through your workout. We cut through this one at blazing speed! 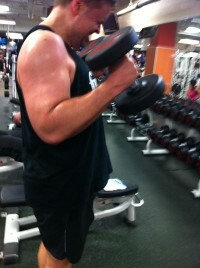 notes: Getting a good pump going in my arms already! notes: I didn’t feel like I could control the 40s, so I dropped. My first time trying pronated kickbacks (keep your palm facing the ceiling the whole time)… I like them MUCH better!! I think we have a winner!! ding ding! goodbye regular kickbacks! notes: This is where my biceps failed! I couldn’t even control the negative any more, so I called it a day. 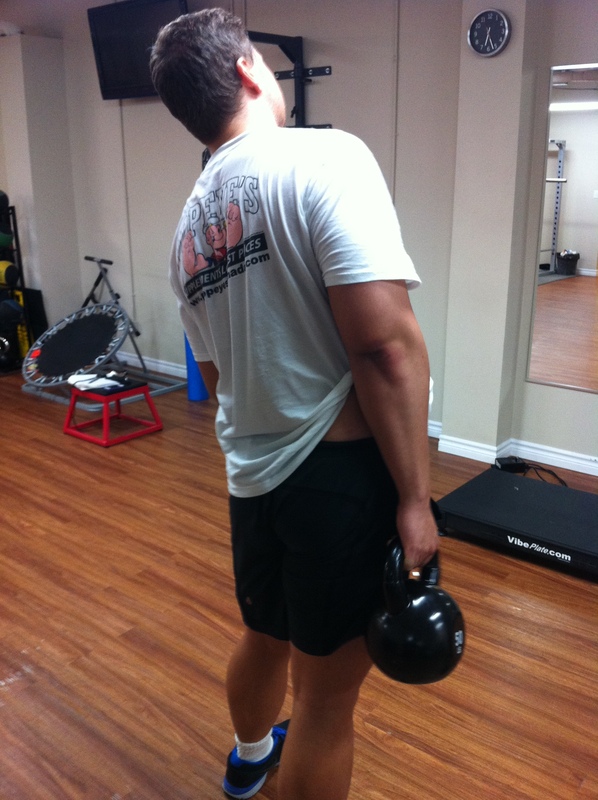 I had wanted to do skulls with a kettlebell, so I tried a DB instead… didn’t like it. ROM was too small, DB kept getting close to my head. BB next time, F it. Katie was definitely feeling it, she couldn’t pick up the workout sheet off the chair by the end, her grip was gone, arms pumped!! A nice and hard arm workout! Great way to kick off my Saturday! Workouts aren’t always PR’s and rainbows. Some days you just have to punch the clock, feel a bit of pain and just grind away. It is an important lesson to learn, and one that wipes out most of the weekend warriors – persistency and consistency. If you don’t stick with it, you will not change your body. So… some workouts are just miserable. This was the case with me on Tuesday. No personal records, just putting in work. notes: Maybe I am being too hard on myself, my weight for the V-Bar and DB Rows was actually good for me. But my energy dropped out fast on the back exercises, usually I have more endurance than that. Even worse, my tendinitis flared up in my right elbow (probably from Monday’s BB Curls), and Spider Curls just could not get going without pain. So I did concentration curls, which supports the part of my elbow that was hurting, then I used the machines, which did not cause any pain. 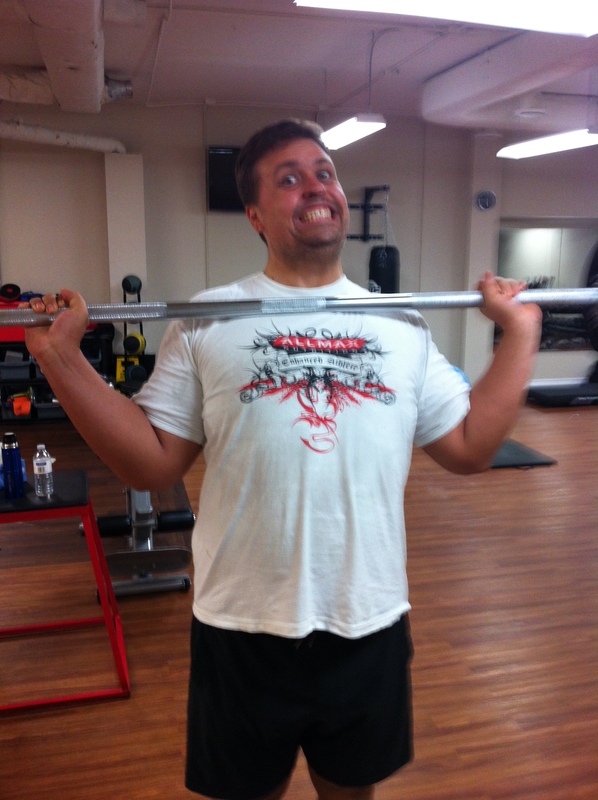 I did an FST-inspired set on the machines, 7 sets in a row with 30 secs rest, you get tired fast! But hey, at least the workout got done. What about you? Any good workouts lately? Worn out! Bombed out and depleted. Sore low back, sore shoulder, massive leg soreness developing, energy stores were ok though. I decided I needed to get the blood moving and stay active. And so that means… double workout day! Who doesn’t love going to the gym twice? As you can see, still doing the triple drop sets. 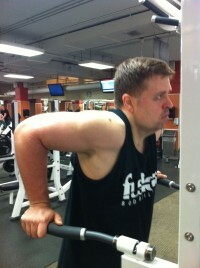 V-Bar pushdowns are fun because you can usually go a bit heavier, so I put it in first to wake the arms up. Heavy weight early off gets the hormones flowing. Unlike a regular pushdown where the elbows stay pinned to my sides, with the v-bar I hover over it and push it straight down, hence the higher weight. By now the triceps were getting fatigued, but I like the overhead extension, it really hits the long head of the tricep nicely, so I don’t mind this as a finisher. Just stand up straight, keep your upper arms still, and drop the rope behind your head and squeeze it back up. I decided to do some calves. This was FST-7 inspired (its a training system), so I kept the rest low and repped it out. The standing machine is nice because you can drop your heels below parallel and really stretch the muscle out before you contract it and push the weight up; keeping the reps slow and goin down low!. By set 7 my calves were smoking tired and I couldn’t get all 20 done. My calves can take a beating, but this one got the best of them! After work I headed to the studip to train with Les. Empty studio! After a quick conference, Les decided we would do some shoulders and biceps then just work on abs forever and ever and ever. More core in store! Believe it or not, this also warms up the core a bit. You need it to keep the bar steady over your head and to keep your body straight. 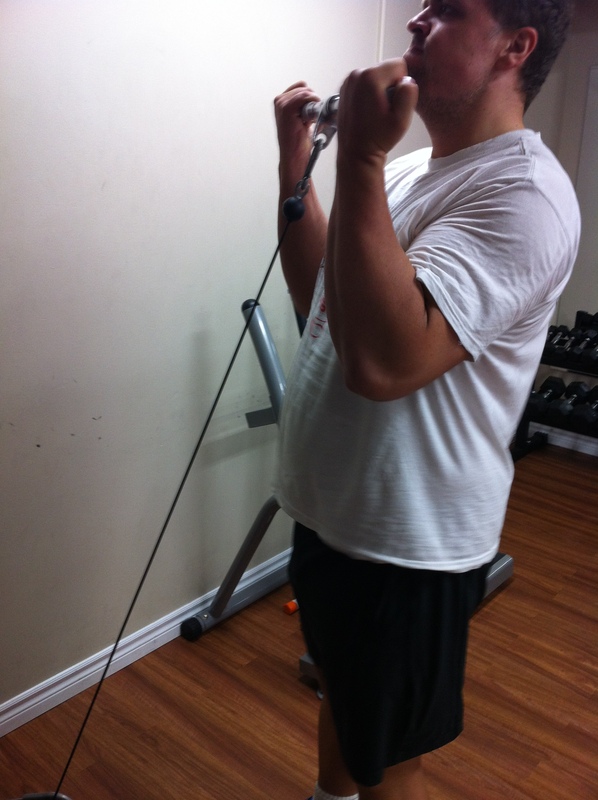 I have a bit of tendinitis in my right forearm, so cable curls are always easier on my joint pain for some reason. 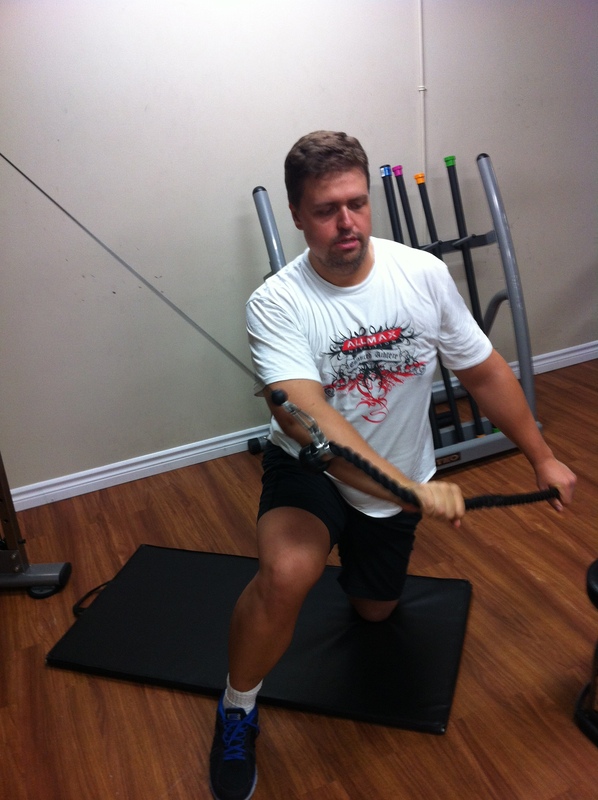 don’t use your arm strength, keep the raised knee steady, try to twist with the abs! Its like paddling a canoe, sort of. I put on a brave face but I really was tired! And that was my day! How about you? Any good workouts?